The XOLO Q2000 recently made its way into the market, whereas the Micromax Doodle 2 has been there for a while now. Both devices are seen as affordable phablets, and alternatives to other more expensive options, particularly the Galaxy Note series from Samsung. If you are in the market looking for a device like this, and are confused between the two, read on as we dissect the phones down and talk about the specs in detail! Both devices come with 5.5 inches or greater worth display, which is what makes them phablets. The Micromax Canvas Doodle 2 comes with a 5.7 inch screen, whereas the Q2000 from XOLO features a marginally smaller 5.5 inch screen. Both feature an HD resolution of 1280 x 720 pixels, but due to the smaller diagonal across XOLO Q2000’s screen, the device has a greater pixel density. The Q2000 sounds like it would fit the hand better, due to the marginally smaller screen. However if you are not in a mood for a small screen, you can go with the Doodle 2, the say is yours. The Doodle 2 features the MT6589 which came in a few months back, and which operates at 1.2GHz per core on its 4 cores. On the other hand, the XOLO Q2000 features an MT6589W chipset which is a slightly downgraded version of the MT6589. Xolo official spec sheet claims GPU frequency to be 357 MHz and that implies there shouldn’t be a significant difference in processing power. The camera department in this comparison is a bit of a mixed bag. The Doodle 2 features a 12MP + 5MP set, whereas the Q2000 does a 13MP + 2MP one. There shouldn’t be a lot of difference between daylight quality of pictures coming from the rear cameras of the two phablets, but you can expect the Doodle 2 to have a significantly better output from the front shooter, which should help during video calls, and this is why we would pick the Doodle 2 over the Q2000 based on specifications. The Doodle 2 does an impressive 16GB of on-board memory, whereas the Q2000 comes with exactly the half of it. However, if it comes down to storage, we’d pick the Q2000 thanks to the microSD slot it features, which is something missing on the Doodle 2. Batteries on both devices feature exactly the same capacity – 2600mAh. You can expect the Q2000 to talk you about an hour or so longer, thanks to the lower energy requirement of the GPU as well as the screen that’s smaller by 0.2 inches against Doodle 2’s 5.7 inches. Both screens come with the same HD resolution, so there will be about the same power intake so that shouldn’t be a factor to be considered here. The Doodle 2 comes with a stylus in true phablet spirit, while the Q2000 doesn’t. Also, the Doodle 2 comes with a few more features like blow to unlock, etc. We assume since you’re looking for a phablet, you would like the 5.7 inch screen more. 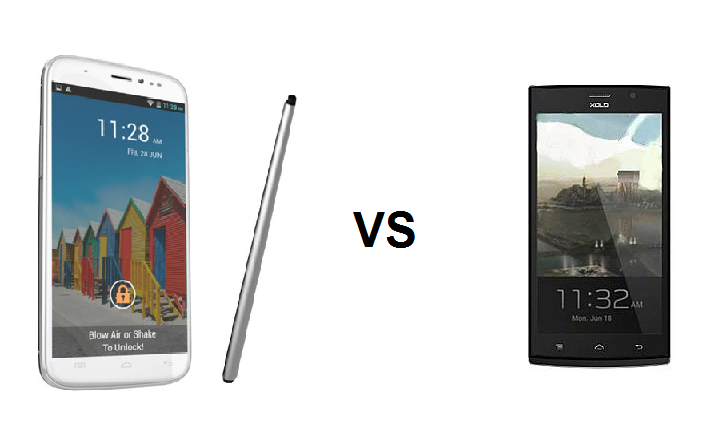 That is only one of the few more reasons, which according to us, make the Doodle 2 a better phablet than the Q2000. The 5MP front camera, better/more polished software, more powerful GPU, these are the remaining ones which contribute to the rise of Doodle 2. However, you will have to live with one major shortcoming, that is the lack of storage expansion. If you can live with this, the Doodle 2 is for you. Also, not to forget, the stylus which comes along the Doodle 2 can increase productivity manifold.